Seven years have passed since the accident at Tokyo Electric Power Co.’s (TEPCO’s) Fukushima Daiichi Nuclear Power Station in March 2011. This report will provide a general overview of how the reactor decommissioning is going, examine the contaminated water treatment issues and convey the reactions of citizens attending public hearings in late August regarding the current state and policies for dealing with the contaminated water. The multi-nuclide removal facility, ALPS, has been touted as removing all nuclides except tritium, and as ALPS-processed water is known as “tritiated water” citizens believed that it contained no nuclides other than tritium. However, many citizens were surprised and angered when it was reported just prior to the public hearings that other nuclides besides tritium were also present, sometimes at concentrations exceeding the notification concentration. The fuel debris that melted and dropped out of the nuclear reactors is being continuously cooled and kept in a stable condition by injection of water, which generates radioactively contaminated water as a consequence. Various efforts are being made to suppress the increase in contaminated water, but a policy on its ultimate disposal has yet to be established, so enormous quantities of contaminated water are being stored on site in tanks. Work has proceeded on the retrieval of fuel rods from the spent fuel pools, prioritizing Unit 4, where the retrieval was completed in December 2014. Fuel rods still remain in the spent fuel pools of Units 1 to 3. The plan was to next retrieve the spent fuel from the Unit 3 pool starting from around the middle of this year, and work is underway to install special facilities for handling the spent fuel. Investigations are advancing to ascertain conditions inside the reactors so that the fuel that underwent meltdown can be retrieved. TEPCO is aiming to identify the location of the fuel by utilizing scattering tomography of penetrating muons (cosmic rays). Other efforts include obtaining video images and data on radiation by developing and using robots for investigation. Nonetheless, there are still many uncertainties about detailed conditions inside and below the reactors. The current aim is to start retrieving the fuel from one reactor (yet to be determined) in 2021. Operations to clear debris on site have progressed and radiation levels have declined to a relatively low level, and thus in about 95% of the area full-face masks and protective clothing are no longer necessary and it is currently possible to work there wearing only regular work clothes. ● What is causing the water to become contaminated, and why is it increasing? Abundant groundwater exists underneath the Fukushima Daiichi plant site, and it always flows from the west (where there are mountains) to the east (toward the ocean). The basements of the reactor buildings were damaged in the earthquake, which caused them to crack, and it has become possible for groundwater to flow into them through these cracks. The fuel that underwent meltdown must be kept cool at all times through injection of water, which comes into direct contact with the nuclear fuel, resulting in elution of radioactive substances into the water, producing radioactively contaminated water. To keep that radioactively contaminated water from leaking from the reactor buildings, the water level inside the buildings is controlled using subdrains to ensure that the groundwater level outside the buildings is invariably higher than that inside the buildings. Keeping the water level inside the reactor buildings lower than the groundwater level makes it harder for the contaminated water inside the buildings to leak out, but at the same time, it also makes it easier for the surrounding groundwater to flow into the buildings. This is why the amount of contaminated water continues to increase. Sixty-two radionuclides1 are targeted for removal from the contaminated water and are checked for in the resulting water. 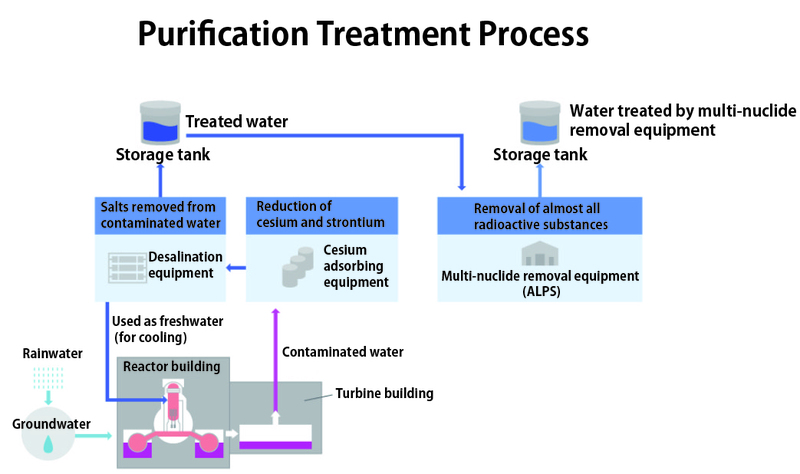 The process of contaminated water treatment starts by separating out cesium and strontium using SARRY (developed by Toshiba and others) and Kurion (developed by Kurion Inc. of the U.S.) treatment systems. After that, salts are removed using desalination equipment. Part of the water treated that far is recycled for use in cooling the reactors again, and the rest proceeds through the Multi-nuclide Removal Facility, ALPS (Advanced Liquid Processing System, developed by Toshiba)2, where radionuclides other than tritium are separated out. After treatment by ALPS, the water is stored in tanks (Fig. 1). As of March 2018, about 1.05 million m3 of ALPS-treated water was being stored, with an annual rate of increase of about 50,000 to 80,000m3. The ALPS-treated water has a tritium concentration equaling about one million becquerels/liter (Bq/l), with the total amount of tritium estimated as equivalent to about one quadrillion Bq. The cause of the increase is the abundant groundwater. The following measures are being taken to keep groundwater from approaching the reactor buildings. 1) Groundwater is pumped up on the west side of the site before it can reach the reactors, radioactivity measurements are taken, after which it is released into the ocean. 2) A watertight wall (of frozen soil) has been installed surrounding the cluster of reactor buildings. 3) A subdrain system on the inner side of the frozen soil wall lowers the groundwater level there. 4) A watertight steel wall has been installed outside the frozen soil wall on the seaward side. 5) Water is pumped up on the inner side of the steel wall to prevent contaminated water from flowing out to the ocean. 6) “Facing” has been applied (covering exposed ground, etc., with asphalt, etc.) to prevent rainwater from penetrating the soil. As a result of these measures, the amount of contaminated water generated is reported to have decreased from about 520 m3/day (average from Dec. 2015 to Feb. 2016) to about 140 m3/day (from Dec. 2017 to Feb. 2018). ALPS consists of a pre-processing facility employing iron coprecipitation processing and carbonate precipitation processing, and a main facility with a combination of different kinds of adsorption towers (Fig. 2). The adsorption towers in the main unit are composed of a combination of colloidal adsorption material using activated charcoal, strontium-adsorbing material, material that adsorbs both cesium and strontium, antimony-adsorbing material, silver-adsorbing material (for adsorbing iodine) and others, The adsorption towers are consumables. In other words, once they have removed a certain amount of the target substances their adsorption capacity decreases, so conditions in the adsorption towers must be checked and the towers replaced when necessary. During the ALPS performance testing stage in 2014, the concentrations of each nuclide species before and after processing were checked and the above-mentioned composition of the adsorption towers was adjusted or additions made. At the performance testing stage, sufficient removal of Co-60, Ru-106, Sb-125 and I-129 was found to be difficult, and the concentrations of some nuclides reportedly exceeded the notification concentrations. I-129 residues were handled by increasing the silver-adsorption towers. Subsequent investigations confirmed that after the adsorbing material was replaced the performance was maintained for a period of about 20 days, and that during that period the concentrations in the treated water were lower than the notification concentrations. When the adsorbing material was replaced with high frequency, however, the reduced rate of operation of ALPS was regarded as a problem. This was because, at that time, there existed large volumes of contaminated water being stored in tanks onsite awaiting ALPS treatment, and the radiation doses at the boundary of the plant’s grounds was growing higher. Reducing the radiation doses at the site boundaries was given precedence, and the decision was made to operate the facility without increasing the frequency of adsorption tower replacement for the time being (permitting operation with insufficient treatment performance). ALPS is the final process in the treatment of the contaminated water, so whether or not radioactive substances remain that cannot be completely separated and eliminated is an important point to consider in the disposal of radioactive wastes. The maximum concentrations of the main radionuclides detected in ALPS-treated water in fiscal 2017 and the corresponding notification concentrations in the effluent are shown in Table 1. Also, when radioactively contaminated water is treated, in addition to the treated water, it goes without saying that slurry containing the separated radioactive substances, used adsorption towers and other radioactive wastes will be generated. These have high levels of radioactivity; for example, strontium concentrations as high as 109 to 1010 Bq/l. These contain water and there is a risk of hydrogen generation through radiolysis. Thus, dehydration processing is being promoted and stable storage of solidified waste is being considered. No decision has been made, however, on these disposal policies. Regarding ALPS-treated water, the Japanese government created the Tritiated Water Task Force (Dec. 2013 to Jun. 2016) and had it conduct a technical evaluation of disposal methods. It evaluated five options, geological disposal, land burial (solidified in concrete), oceanic release, atmospheric release (as steam) and a second type of atmospheric release (as hydrogen) (see Table 2). Following up on that, it held a meeting of the subcommittee dealing with water treated at the Multi-nuclide Removal Facility in November 2016 to conduct comprehensive consideration of the societal impacts of reputational damage from harmful rumors and other issues. It held public hearings in August 2018 to get a broad overview of the views of Japan’s citizens on the problem of reputational damage. In addition, Toyoshi Fuketa, who chairs Japan’s Nuclear Regulation Authority (NRA), has been asserting that the ALPS-treated water should be diluted and released into the ocean. His stance is evidently that releasing water containing radionuclides other than tritium is not a problem as long as they are diluted to below the notification concentrations. Public hearings were held at a total of three locations, two in Fukushima Prefecture and one in Tokyo. The number of people voicing their opinions were 14 + 14 + 16 for a total of 44. To be allowed to express their opinions, the participants had to present a written outline of their views beforehand, a high hurdle to clear for participation. Moreover, the participants were limited to five minutes each to present their views at the hearings, and it seems there were announcements at the hearings that the audience was not permitted to say anything, or even clap to show approval. At the hearings, the secretariat first briefly described the content of the subcommittee’s discussions to date. That content was decommissioning conditions, the amount of ALPS-treated water being stored, properties of tritium (biological effects are small, oceanic releases are occurring worldwide, but no harm to health has been recognized), reasons for the need to dispose of the ALPS-treated water (on-site storage space tight, debris-removal work being delayed), evaluation of the five disposal methods, and societal impacts of reputational damage. Of the 44 people expressing their opinions, only two people, who had requested government aid for developing a beta-ray measuring system, expressed qualified approval of releasing the water into the environment. All of the others expressed opposition. The main views that were expressed are listed below. 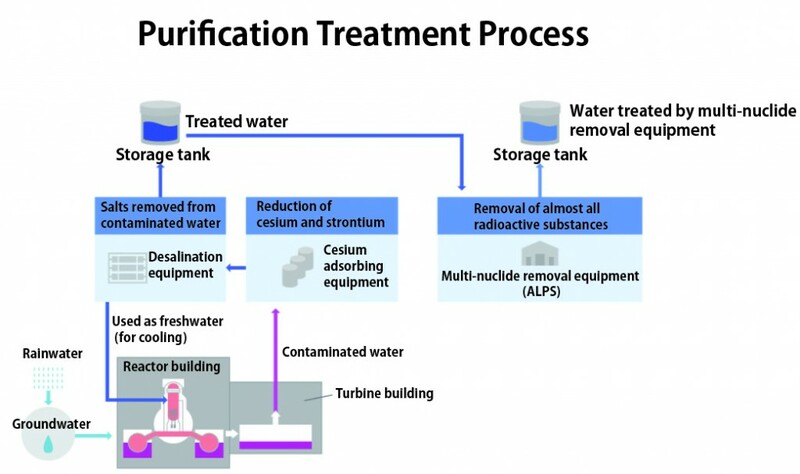 ● The discussion has been about disposal of what is being called “tritiated water” by the subcommittee and the press, with the assumption that all radionuclides other than tritium have been removed. Residual nuclides of other species have been confirmed at levels above the notification concentrations, so the discussion should start over again from the beginning. ● The scale of the public hearings is too small, and too few are being held. Since they are being held only during the day on weekdays, many people are unable to participate. This does not constitute hearing a wide range of citizens’ views. This is a major problem, so hearings should continue to be held and arranged so that many people can participate. ● From the perspective of environmental ethics and the London Convention on the Prevention of Marine Pollution by Dumping of Wastes and Other Matter, releasing radioactive substances that are being stored under current conditions into the environment should not be done to begin with. ● When disposing of radioactive substances, wouldn’t it be necessary to regulate not only the concentration but also the total amount? ● If oceanic release is carried out, the ocean off Fukushima’s coast should not be polluted any more than it already has. It is necessary to consider other places to release it. ● No monitoring system has been established for the case of releasing tritium into the environment, and infrequent testing of marine products and the marine environment would not be capable of evaluating safety or danger. ● The subcommittee is disregarding tritium’s biological effects. ● Storing the water in large tanks and waiting for its radioactivity to attenuate entails the least risk, so would it not be the most realistic method? Hearing the opposition of many participants to environmental release of ALPS-treated water, the chairman of the subcommittee ended the hearings, concluding that the opinions would be considered in discussions to continue. Several media outlets reported on the hearings, drawing public attention to them. The author got the impression that under these conditions, it would not be possible for them to force through oceanic releases right away. What kind of decision the Japanese government will make in reality remains to be seen, and we will keep an eye on future trends. 2 Multi-nuclide removal equipment, extended multi-nuclide removal equipment and high-performance multi-nuclide removal equipment exists. The high-performance type was developed by Hitachi-GE.